Spray 13x9-inch (3-quart) glass baking dish with cooking spray. In 4-quart Dutch oven, melt butter over medium-high heat. Add chicken; cook 3 minutes, stirring occasionally. Stir in bell pepper, celery, onion and garlic; cook about 2 minutes, stirring occasionally, until chicken is no longer pink in center. Reduce heat to low. Add half-and-half, broth and cream cheese; cook and stir until cream cheese is melted. Gradually add Gouda cheese, stirring until cheese is melted. Remove from heat; set aside. In bowl, mix cottage cheese, 1/4 cup fresh basil and the egg until blended. Spread 1 cup chicken mixture in baking dish. Top with 3 noodles, 1 1/2 cups chicken mixture, 1/2 of the cottage cheese mixture and 1/2 of the mozzarella cheese. Repeat layers once, starting with noodles. Top with remaining 3 noodles and remaining chicken mixture. Sprinkle with Parmesan cheese. Cover with foil; refrigerate at least 8 hours or overnight. Heat oven to 350°F. Bake lasagna covered 45 minutes. Uncover; bake 30 to 35 minutes longer or until noodles are tender and casserole is bubbly. Cover; let stand 15 minutes before serving. Garnish with basil sprigs. Add 1 1/2 cups julienne-cut cooked ham to lasagna layers for a flavor twist. 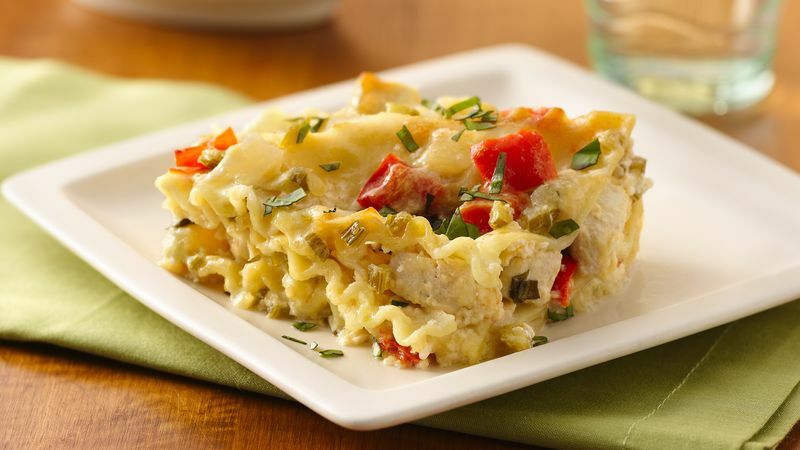 No-cook lasagna noodles are available and can be used in this recipe for immediate baking.